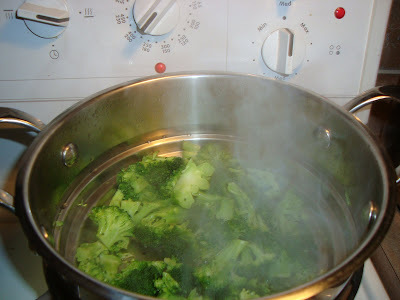 Since I have joined Weight Watchers, I have been trying to eat more veggies. So I have been creating some veggie-full dishes. This the meal I created the other night. 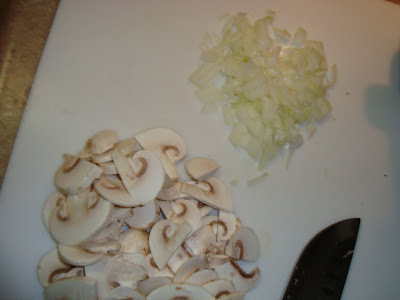 In a fry pan, I sauteed the onion til translucent, then added the mushrooms and roasted red peppers. 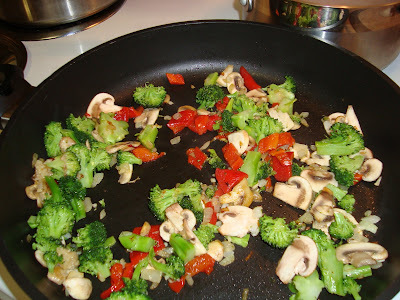 Once the broccoli was done (still crisp), I added it to the fry pan. And a tsp of chopped garlic and seasoning. 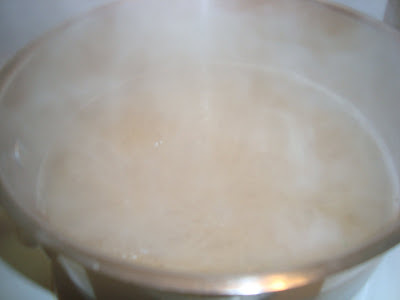 I then got the water boiling for the whole wheat pasta. In my mini food processor, I added a couple tablespoons of 1% cottage cheese, a tsp of chopped garlic and a couple tsps of parmesan cheese. I whizzed this up and then added a splash of milk to make it creamier. Note: I then microwaved this to warm it up - bad idea - it completely separated and got real weird - I still used it though. 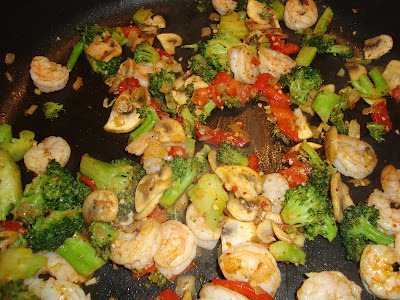 Once the veggies were cooked and the pasta was on, I added the shrimp to the fry pan. 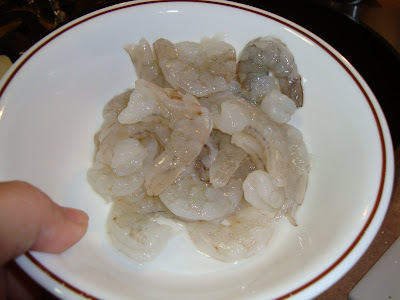 It only needs a few minutes to cook the shrimp. When the pasta was done, I drained it and then mixed in the sauce. 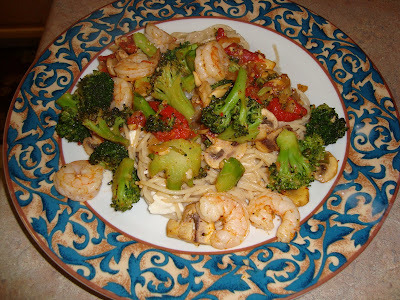 I plated the pasta and then topped with the shrimp veggie mixture. Even though the sauce went wonky on me, it still tasted fine. This made enough for lunch the next day. Kim, This recipe is reminiscent of my favorite recipe from my 30s, with the yummy change to whole-wheat paste. 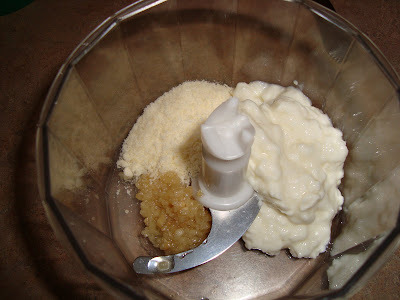 And I love the idea of smoothifying the cottage cheese (a trick I learned later from the a Graham Kerr cookbook). 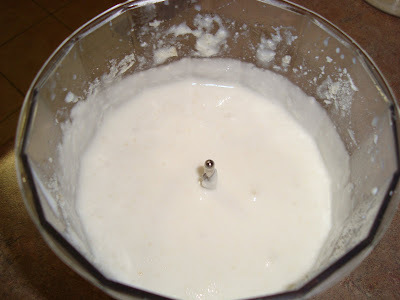 Sometimes I suspended the pureed cottage cheese in a sieve or colander lined with cheesecloth for a while to allow some of the water to drain for a thicker sauce.